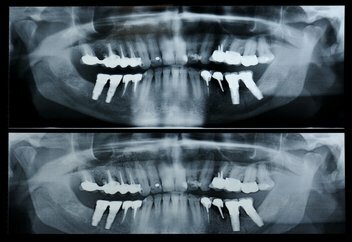 A panorex is a 2-D image that it is capable of identifying issues and structures that a small intra-oral x-ray cannot. Once positioned in the machine, it will rotate around your entire head taking a full 360 degree view of the teeth, head, sinuses and bones. This is the same machine used to take 3-D images, the Gendex GXDP-700. The ability to view the full structure of your head as a whole is very informative to the dentist. It will allow us to see any potential problems and make sure that everything is functioning as it should be. The panorex image is capable of viewing specific types of structural problems, infections, fractures, tumors, cysts, among other pathology.